Organic paints are not only more sustainable, they also have their own look and feel to them. This is because of the pigments: natural pigments look more balanced and harmonious than petroleum-based pigments. Milk paint is an old and ancient paint, it's an organic paint by tradition. Caseine is the binder, it's a milk component and one of the strongest glues around. Milk paint can be bought in powder-form, and stirred to paint with water. Once wet, it has to be used within days (after that, it decays). 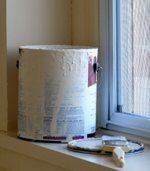 Milk paint holds well on plaster and untreated wood, it needs an absorbing underground. Wallpaper can be painted too, depending on the absorbing qualities of the wallpaper. 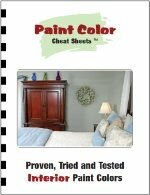 Milk paint is matte, and can be made shiny by painting it over with a laquer - for that, you might take an acrylic binder, or a soy-based urethane sealer (search for Eco-Tuff-High-Traffic-Clear-Coat). The colors of milk paint are limited, but you can mix them as you like it. Technically: I don't know if the milk for milk paint is harvested on an organic farm, but milkpaint is already such a good alternative to oil-based or synthetic paints, that we might just step over that. 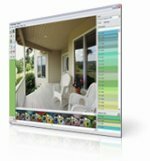 Auro and Livos have oil-based house paints, that are free from chemical components. They're also 'oldfashioned' organic paints. Their binder is linseed oil, which is on itself completely harmless and edible. Both brands are made with natural pigments, which makes their colors pleasant to have around. They can't be color-matched however - there's a limited set of colors available, and if you want different tones, you need to do your own mixing. These paints don't look like regular oil-based paints at all. They have a slightly different texture, and the smell is really different - real turpentine is a tree-resin and its smell is a bit similar to eucalyptus or tea-tree oil. They take about 24 hours to dry (no alkyds are involved). 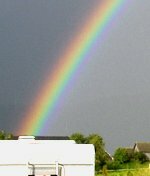 The pro's are their durability - oil-based paint has been around for hundreds of years and have proven their performance. It makes a beautiful film that can protect even exterior woodwork. 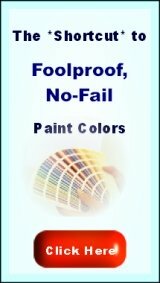 This is a new kind of paint: waterborn alkyd paint. Soy oil is the crude material of which alkyd resins are made, so soy paint is a kind of alkyd paint. 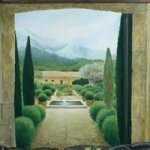 Dura-soy paint is an emulsion (oil and water mixed to a water-soluble substance), so it's waterbased but does make a good film. It's very high on solid particles - thick, fluffy paint that has very good hiding capacities. It can be matched in any color, of any brand (as long as you know the color's brand and number) - search here for non-toxic-paint - dura-soy one. Dura-soy can te applied without priming first. It comes in only one sheen (semi-flat), but it levels out and makes a tough film. It can be made shiny by applying an extra (glossy) sealing layer, which also is available in a green variety - search for for Eco-Tuff-High-Traffic-Clear-Coat here. Tempera paints you can make yourself, with eggs and pigments. The proportions (amounts of pigments and egg) is important for having good paint that doesn't powder off. Click here for more on making tempera paint. 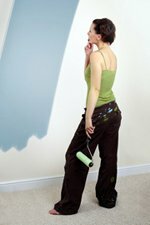 Most organic paints can also be called low voc paints, but especially turpentine-thinned oil-based paints (Auro, Livos) do emit some VOC (volatile organic compound). It's the turpentine. But, real turpentine originally is just a tree resin. Original turps do smell, but they smell good, like essential oils. 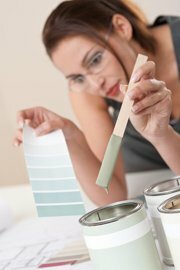 Still, waterborne paints are more preferrable when painting a nursery, bedroom or if you just don't like odors. Waterborn paints don't have this voc-problem. get one first, pick room colors from it and make your own color scheme!